The many thoughts of a reader: 100th post and giveaway! I have hit the way too hyped 100th blog post. It’s almost a certain bust because this is where I talk about how awesome it is to blog, how many wonderful blogs I’ve found and how I’ve grown as a writer and yada, yada, just get to where you are giving something away is what most people will be thinking about this point. So as to not disappoint and to not say anything ridiculous and pointless I am giving a book away. Surprised? You shouldn’t be, since I started this blog as a place to write my book reviews and has hosted other random thoughts that invade my ever busy mind. So what book have I picked? 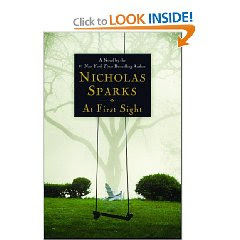 Well, as my first (hopefully more to come) giveaway, I am giving away a slightly used copy of At First Sight by Nicholas Sparks. I read this last summer and I bawled. But I don’t know of a Sparks novel, where I have not bawled like a little baby by the end. 3. Blog about the giveaway and link to my post.. Contest is open until September 28th at 7:00 p.m. eastern standard time. Well I always read and almost always comment and can't pass up a good book giveaway, so I'm in! Wow I am knew to your site as of earlier today. I love your site, never heard of the book, but sounds extremely interesting. Sign me up. Happy 100th post! I have already read this so on the off chance that I win, do the random # generator again and give it to someone who hasn't. Fantastic book. NS is the best! Congratulations on your 100th post! It takes awhile before you feel like many people are reading. I think you are doing great. I follow you in my Google Reader. I haven't read this book, so please sign me up. Also I love Nicholas Sparks and have never read this book. My favorite of his books was the one that ended up being a movie with Mandy Moore. The movie was terrible but the book was great- can't think of the name though. would love this book, sounds like a great read.